In my Friday roundup of famous New York-style pizzerias, I left out the one pizza company that could technically be called the most recognizable New York pie — at least to those who live outside the city. Sbarros Pizza is a fixture of shopping malls and roadside traffic stops across the nation. In fact, “across 30 countries” according to the website. In many of these countries, Sbarros is most likely introducing the actual concept of pizza, much less its modified ‘New York style’ offering. I was surprised to learn that Sbarros actually got its start in Brooklyn, 50 years ago, and in a fashion similar to Lombardi’s Pizzeria. 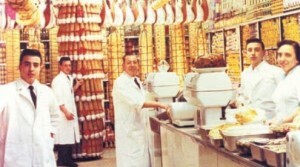 It too was started up by a Neapolitan named Gennaro — the highly alliterative Gennaro Sbarro, to be exact — with his wife Carmela and their three sons. Like Gennaro Lombardi, the Sbarros didn’t start off selling pizza either. Their original salumeria (delicatessen) in Bensonhurst, Brooklyn, was located at 1701 65th Street and 17th Avenue, opening in 1959 and serving the usual Italian-style deli fare, eventually incorporating pasta and pizza onto the menu — and sit-down service along with it. The similarities stop there. The Sbarros had a mind to expand, keeping a tight reign on their operation as they opened 14 additional New York locations well into the 1970s, with all the food made at the original Bensonhurst location. Carmela even continued to personally make the cheesecake. It could have stopped there, but keep in mind that the 1970s was the age of the shopping mall, and the lure of the food court greatly appealed to the Sbarros. Their first experimental pizza outlet was at the King’s Plaza mall in Marine Park. It was here that Sbarros became a counter fast-food restaurant, shedding its salumeria image for a bright, uniform place with a set menu of popular Italian standards. Needless to say, it was a successful experiment. Incorporating the family business in 1977 and opening the brand up for potential franchises, the Sbarro sons took their restaurant chain national by the 1980s after their father’s death, and rolled it out to international locales by the 1990s. The original Bensonhurst Sbarros was closed a few years ago, and it’s difficult to find the inherent Brooklyn-ness in a standard-issue Sbarros restaurant today. But if you look carefully, you might find some dusty, fake-looking meats hanging in the window, harkening back to its early Bensonhurst roots. It’s definitely the closest you’re ever going to find New York-style pizza in, say, Salt Lake City or even Kazahkstan. ← 1969: Astronauts land in New York!